An examination of the vibrant traditional and folk arts inspired with the sacramental use of peyote by members of the Native American Church. Controversial and misunderstood, the ritualized use of peyote by American Indians has long been attacked by non-Indian religious and secular authorities. Despite official efforts to eliminate peyotism as far back as the Spanish Inquisition and as recent as the War on Drugs, its status in Native American spiritual life has not diminished. Peyote is the holy sacrament of the Native American Church, and the peyote religion provides spiritual comfort, social benefit, and a creative outlet for hundreds of thousands of American Indian people. Grounded in older tribal religions from the Plains regions, the Native American Church was the first native religious movement organized and disseminated on the model of western Christian denominations. While providing opportunities for maintaining and strengthening tribal identities within a common, intertribal organization, the church also fosters a vibrant folk art tradition. Works by self-taught and informally trained artists make up the diverse traditional and folk arts associated with the peyote religion. Peyote art displays an amazing range of generes, including carving, beadwork, featherwork, metalsmithing, and painting. 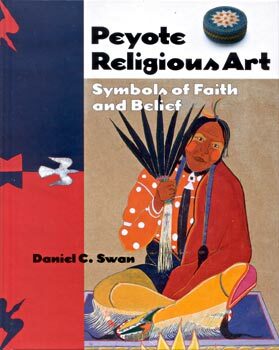 The ritual objects and religious setting of the peyote religion provide core elements for the rich symbolism associated with the art of the Native American Church. Featuring previously unpublished first-person narratives by practitioners of the religion and by artists, this book is the first to give a comprehensive examination of the art of peyote religion and the church. It is enhanced by photographs of art objects from museum collections, of works by contemporary artists, and of materials from private family collections. Understanding these expressive forms provides fascinating insight into the challenging nature of American Indian life during the twentieth century and the intertwining art, religion, and the community. Daniel C. Swan is senior curator at the Gilcrease Museum in Tulsa, Oklahoma. He has published numerous articles on the peyote religion.